The boys were very successful in the mini sevens tournament held here on our school pitch in Slane. They won all of their three games and went on to play in the county final stages in Dunganny. They beat Wilkinstown NS and Gaelscoil na Cille and progressed to the semi final stage where they took on Kildalkey. Unfortunately, they were beaten by two points. Thank you to Mr. O’Connor and Mr. Fagan for coaching and preparing the team for this competition. Well done lads! 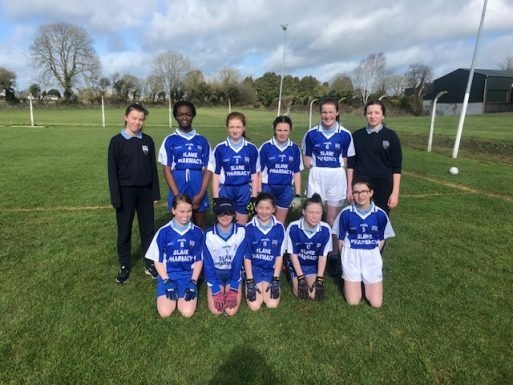 The girls performed very well in their mini sevens competitions in Kilberry. They beat Wilkinstown NS and Stackallen NS and drew with Yellow Furze. They faced a big challenge against a strong Castletown side and unfortunately lost the game. All girls gave their best effort. Thank you to Mr. Ó Braonáin and Ms. Gerrard for working with the team. Well done girls!